How should I be training to climb Island peak This will depends on a range of factors and requires a lot of different elements. 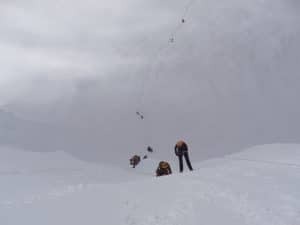 Watch these two video and then let’s reflect on how you should be training for an Island peak climb. What do you see in the video’s? I see mixed steep terrain on rock, snow and ice. I see a steep head wall from 6,080m/ 19,947ft. to 6,189m/ 20,305ft carrying a back pack in cold and warm temperatures with 50% less oxygen getting to your muscles. From base camp at 5,100m/ 16,732feet to the summit is steep terrain at high altitude. That is why we use the high camp at 5,500m/ 18,045 feet. Remember you have to trek into Everest base camp and climb Kala Phattar at 5,642m/ 18,510 feet. over 9 days walking 5 to 8 hours per day as part of the acclimatization schedule. Yes you will gain additional conditioning by doing this trek and with our excellent acclimatization program you will gain the acclimatization in the right way. What are the different types of training needed for a successful Island peak summit? Endurance training: You need to improve your stamina and endurance training to be able to walk for 18 days. You need endurance training in your routine to fight fatigue in your muscles which will be critical high on Island peak, and you have to walk distances at altitude on a multi-day basis. Endurance training contributes greatly to your overall health, giving energy, improved heart function and increased metabolism. You build your endurance training by gradually increasing time to your cardiovascular training sessions. I train for 1 hour 30 minutes per day trying to keep a consistent heart rate in my endurance zone. I also do a longer session or hike once a week up to 6 hours so that I can further my strength and endurance. This will be different for each person. Do a fitness test and find out your training zones so you can be more efficient in your training and preparation. Depending on where you are starting from in your training you should be looking to increase your training sessions from 30 minutes to 50 minutes to 90 minutes over a 12 to 20 week period and 4 or 5 times a week. On one of your training days you should be looking to go for a longer endurance session building from 3 to 6 hours of Hiking, preparing better for multi-day trips. While on these longer hikes you need to take plenty of breaks, drink plenty of water 3 liter minimum and bring some food and maybe some energy bars. To further build endurance and after a month of initial training where you have been doing 3/4 hours in the gym and 3 hour hikes you need to add more time and days training. Limit rest days and try and add multi-day trekking. You should be building to 5/6 days a week. As your strength and conditioning progresses and after 2/3 months you should be looking at add more weight into your back pack and increase the length of each training session. Also consider adding stretching before and after each session. Flexibility is an important element in your training. Weight Training: Training every part of your body is so important for Island peak. You need core stability training for excellent balance, super leg strength and overall body conditioning. You will be gaining conditioning from carrying a back pack with weight in it for hours each week. You need to supplement this with a specific weight training plan including core, lower body, upper body. We are happy to go on skype and go through exercises that will help build specific strength for Island peak. You should consider doing squats, dead lifts, calf raise, single leg squats, leg presses, lat pull down, arm curls and shoulder pushes. You can also consider doing a wide range of other exercises and happy to explore all these with you directly. After 2 months of of endurance training you should be looking to add 1/2 weight training sessions per week to your schedule. Interval Training: After you have built your fitness up and you can hike for 4/5 hours with weighted back pack and you have been training 3-5 times a week you can consider adding interval training into your schedule. Interval training can be done in a range of ways. Ideally, you warm up first for 10 minutes. Then you are looking to push high heart rates for 60 seconds and then completely rest for for 60 seconds and then do it again pushing close to your max heart rate and try and maintain this for 25 minutes. You should be looking to increase this to 35 minutes in one session once a week. You can achieve this on the side of a hill, treadmill or running track. We can talk more about this as needed. Read some REVIEWS from our trips. 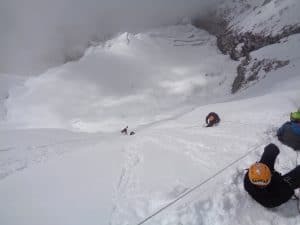 Climbing experience: It is really important to have some level of mountaineering experience before climbing Island peak. It is critical to be able to abseil using a figure of 8 device on fixed lines and being able to move efficiently from one abseil to the next while on a 60 to 70 degree angle. This is really important for your safety and the safety of our staff and other team members. Do not come under prepared in this area or we will have to turn you around. The overall safety of our team will be at the heart of decision making on the mountain. Island peak is highly under estimated, so come fully prepared for the climb. We can help you understand the challenges high on the mountain so feel free to get in touch at any stage. CONTACT US for more information. READ MORE about specific training required for climbing Island peak. READ OUR Top Tips to help you prepare for your Island peak climb. READ SOME REVIEWS.